Binary.com - Must read for UK traders - Bonus info, app and trading strategy info. Binary.com are an established binary options brand and have been evolving in the binary options sector since 1999. The pioneers of this type of investment. The firm have changed brand over the years, and were previously BetOnMarkets.com – rebranding to Binary.com in 2013. They recently added a Bitcoin funded trading account – initially only for non-EU accounts – but continue to stay ahead of the game in the binary sector. Their longevity shows they are not a scam and are a well respected, established brand in both Europe and Asia. Regular award winners in their formative years, the firm now boast a history which has seen them turnover more than $2 billion in binary trades. They also have over 1 million traders using their platform, handling over 1 million transactions per day. Despite competition in the sector Binary.com have maintained their position as one of the leading binary operators, under the tag line “Sharp prices, Smart trading“. Regulated by the Malta Financial Services Authority, the firm is based in Malta, with offices in Malaysia too. They are popular in the region, particularly Indonesia and Singapore. They are also licensed in the UK. Low minimum deposits make them an attractive proposition. Traders can assess the binary options platform, whilst taking minimal risk. Advanced traders will also appreciate the flexibility of the trading platform which allows ‘structuring‘ of trades to enable more complex risk/reward plans to be created and executed. Binary.com App – Yes, for Android and iPhone. The Binary.com platform has been trimmed down to deliver only what a trader needs. With none of the distractions found on other platforms. There are no gimmicks on the trading platform – just the key trading information. This might suit some traders, others may prefer a better ‘presented’ offering when they login. But few can argue that trading is clear and unobstructed. It offers a huge amount of flexibility for the trader. This clarity is why more advanced traders prefer this platform, and it makes using a winning strategy that much simpler. MetaTrader 5 – Advanced CFD trading. This area combines the trade suite with MetaTrader integration, including both MT4 and MT5. This delivers charting on par with the the market leading CFD brokers. The download is a quick process. Binary WebTrader. The WebTrader platform offers traders the ability to watch and monitor multiple underlying assets and trade them at the same time. Binary Next-Gen. This is the mobile app version of the platform. It simplifies trading on the go, from multiple mobile devices. Compatible with android and iPhone, the app delivers a seamless crossover trading experience. Binary Bot. Covered in more detail below, the Binary Bot area gives clients the chance to build and operate their own auto trading robots. It delivers depth and detail beyond the similar services provided at other brokers. Bot scripts can be created and tested thoroughly. The choice of underlying asset is made along the top of the platform. As well as the usual Forex, Indices, stocks and commodities, there are also ‘randoms‘ unique to Binary.com. These are pure speculation and are solely for traders looking for a quick adrenalin thrill. Once the asset class in selected, the choice of option will appear just above the trading fields. So Forex for example, will show Up/Down, Touch/No Touch and In/Out options types. Again, the trading area below will update with the relevant fields once an option type has been selected. Each option type is covered in more detail later in the review. The first two fields in the trading area allow traders to select the specific asset they are interested in. The actual asset is selected from the second drop down list. The first field simply reduces the list to make it more manageable. (For example, selecting ‘Major Pairs’ from the first field, will reduce the list to only the major currencies, making selection much easier). The ‘duration‘ (or ‘end time‘) can then be selected. This dictates the expiry time of the option. This allows traders to select lengths of anything between a handful of ticks or seconds, to a whole year if they desire (and anywhere in between). This level of flexibility is unparalleled among other brokers. Once a contract is opened, it will have a ‘live’ price up until the point of expiry. This gives traders the opportunity to close trades – either to take profit or cut losses. There is then a display of the current spot price, and a very small price graph. Beneath these is the payout field. At Binary.com, rather than ask traders to select their stake, they ask them to select the payout. The actual stake required to reach that payout will then be calculated automatically. It is the reverse of how other brokers operate, but is clear once traders have got used to it. As these fields are updated, the actual trading buttons on the right will update. The trading buttons are large, and contain all the relevant information – The effective stake, the exact expiry, the direction the asset price needs to move in, the potential net profit and the actual raw payout percentage. Traders need to select the ‘Purchase‘ button to finalise the trade. Traders moving to Binary.com from other brokers may find the trading platform unfamiliar, as it is a fairly unique design. It does however, offer a wealth of flexibility and retains much of the simplicity that has made binary options so popular. Binary.com offer options on forex, commodities, stocks and indices. Their asset lists are good. Currency pairs are the most comprehensive list. Combined with the huge flexibility of expiry times, binary.com offer a large range of options for traders. Touch/No Touch – Will the asset price touch a certain price level within the duration period, or not? The flexibility within the platform allows trades to be ‘nested’, making more complex trading strategies possible, where risk and reward can be shaped even more accurately. Ends In/Out – At the point of expiry, will the asset price be within a preset range of values, or outside of that range? Stays In/Goes Out – Similar to Ends In/Out, but here the question is will the price stay within preset price levels throughout the duration of the trade, or will it move out of the values at any point during the trade – once, at any time, is sufficient. The binary.com tick trade option also delivers a method to profit ‘per tick’, which, while moving away from the binary model slightly, does provide traders a different form or speculating on an asset. The asset lists are constantly growing, especially with the introduction of cryptocurrencies. Binary.com deliver a full range of markets however, including forex (via binary and CFD) plus indices, commodities and metals. They also provide trading on the volatility index (VIX). The volatility index possibly requires it’s own strategy or approach and it will also help to full understand exactly how the volatility indices are calculated. Binary.com have often led the way in weekend trading – they once operated their own indices for this purpose. Now however, global markets are operating outside of “traditional” western trading hours. Forex markets in particular, operate globally 6 days week, around the clock. Binary.com also however, take advantage of markets open at the weekend. So indices open in Tel Aviv or India can be traded over the weekend. While there are volatility and volume considerations to trading at the weekend, Binary.com certainly make it accessible for traders. As the brand have expanded, they have moved beyond just binary options. Binary.com now also offer CFDs (Contracts For Difference). These derivatives offer different styles of risk management to binaries, but open up more varied profit and loss scenarios. Markets offered include Forex, Cryptocurrencies including Bitcoin, Bitcoin Cash and Litecoin, plus metals, indices and commodities. The MetaTrader 5 financial platform opens up these varied investment styles and also lends itself to greater automation. Binary.com deliver a free, high quality mobile trading platform app. Compatible with solely android (2.3 and higher) at present. It allows traders to trade the full range of options available on the website, and the full list of assets. The trading screens retain the same look and feel as the website, and trading remains clear and simple. The portfolio area lists any open trades, and a history of closed trades too. The Cashier area allows for deposit and withdrawal requests. The android app is developed and updated regularly, and an iPhone app is in development and coming soon. Payouts at Binary.com are excellent. They are offer “two way” prices. This means the payout for each option is separate, and can therefore be a little higher. On occasion, some Up/Down payouts will reach 100%, but generally will range from 81% to 94%. As ever, the payouts will vary based on expiry times and the asset selected. Higher payouts are available with different trading options too, such as Higher/Lower. With these High/Low or Touch/No Touch trades, the payouts can reach up to 1000% – this is two way pricing at work. Binary.com offer the largest range of deposit and withdrawal options of any binary options broker. Minimum deposit requirements change depending on the deposit method used, but start from just £5, making them a great starting point for new traders. Bank wire transfers carry a minimum deposit of £25, credit and debit cards have a minimum of just £10 and online e-cash accounts have the £5 minimum deposit option (brands such as Skrill, Neteller, FastPay and WebMoney). With the evolution of cryptocurrency, Binary.com were quick to adapt, and now also accept deposits in a range of cryptos, including Bitcoin, Litecoin and Ethereum. The range of payment methods at Binary.com is very broad. These option vary between the EU and other parts of the world, so traders will need to check what is available in their region. Withdrawals are generally available via the same list of sources. Processing times will vary – for example, a bank wire transfer will take 5 days to process, where an e-cash transaction to Skrill or Neteller will be processed in 1 day. Withdrawals to cryptocurrency will vary based on the currency used, and market conditions. Withdrawals to credit and debit cards will take 3 days to process. The firm certainly offer a broad range of methods for depositing or withdrawing funds, so traders should be able to find a solution that suits them. Withdrawals are often the biggest source of disputes with binary options brokers, so it is worth clarifying the desired method. Withdrawal complaints often stem from verification issues, so traders are advised to arrange that quickly. Charting– Binary.com offer a range of charting options to aid technical analysis. Some tools are downloadable, others operate on the website. Range of Educational material – A range of educational material is available, including eBooks, videos and online seminars. Market Data – Via both chart packages and live feeds, Binary.com offer a range of live market data. Support – Support is offered in a range of languages. Binary.com also offer a feature to build and operate a robot for auto trading. As well as being the home of sharp traders, Binary.com now also deliver ‘advanced platforms’ – the ‘Binary Bot’ platform being the latest. This trading robot gives users the chance to put together an automated trading system. The feature is more advanced than rival broker offerings. There is greater depth and levels of complexity to the settings that deliver a more accurate and precise setup. This enables traders to really be specific about their trade triggers, and operate the robot as an auto trader with confidence. Binary Bot sticks to the Binary.com look and feel, which is cut back and simple. The flashing or pulsing price graphs favoured elsewhere are replaced with more features and ease of use. This is a great new addition for a brand that has always tried to stay at the forefront of innovation in the sector. Auto trading is a big asset at Binary.com and many leading signal providers are able to incorporate auto trading with the firm. The Binary bot expands that flexibility for retail investors. In terms of a bot trading strategy, traders need to tread carefully. While the webinars do provide a tutorial, it is best to learn the bot setup manually for a while at least. The bot download is a simple process and many traders may dive straight into setting up the auto trader, but there are increased risks. For example, automating a martingale strategy via the bot is obviously super-high risk and there is no recovery from a mistake. So use the demo area, back test, run strategies manually and make sure everything is working as designed before handing over control entirely. Binary.com (formerly BetOnMarkets) provide a unique trading platform. It is one which gives the trader a huge amount of freedom. While it retains the simplicity of the binary trade, it also offers unparalleled flexibility. Traders can be precise about when their option will expire. They can set a time frame from just a few minutes to up to 365 days. Likewise, there is also the facility to amend price levels and barriers. This is extremely valuable to traders who like to use In/Out and Touch/No Touch options. It allows advanced traders to configure options to optimise the risk and reward they take on. ‘Nesting’ multiple options is one technique that allows risks to be managed to a high degree of accuracy. This level of trading is really only possible with a broker that allows the level of trade configuration that Binary.com does. 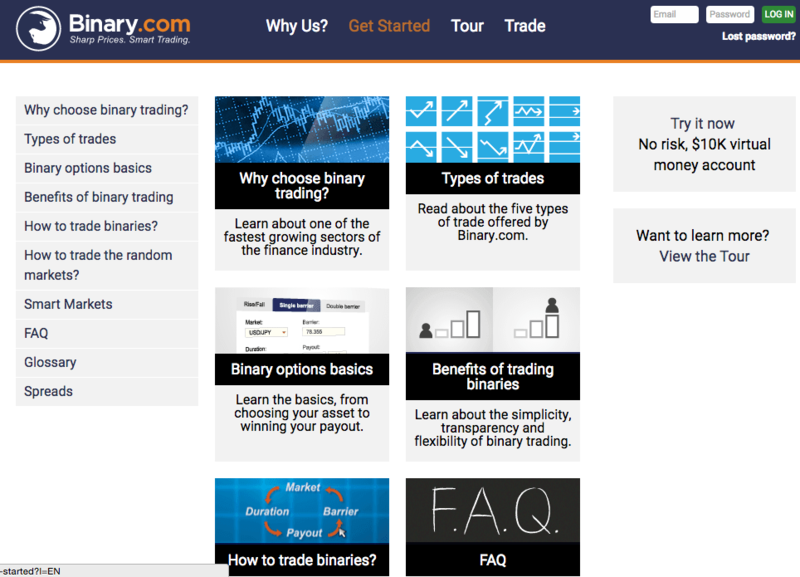 Binary.com offer a range of educational services, and trading information. On occasion, they will release “Mellon on the Markets” as a free download. Written by Jim Mellon, the market update provides insight into when to trade headline events, and how to analyse the markets. Jim also points out when he will be long or short on certain assets. A great read for every level of trader. Binary.com also provide regular webinars (with a schedule posted a few weeks in advance). These provide excellent information into the thought processes of profitable, professional traders. Recent examples include webinars focusing on commodities, weekly market reviews, controlling emotions during trading and advanced techniques. Again, traders at any level can gain something from these presentations. Binary.tv went live on Binary.com in November 2015. It provides market analysis and reviews of popular assets and currency pairs. The features are broken up into short videos. Recent subjects included the volatility in China and analysis on US Home sales data. Both explored the impact on the global economy and specific exchange rates. It provides traders with a laid back overview of headline news and trending topics across the financial industry and can highlight some good opportunities. Below is a short tutorial video. It highlights the simplicity of trading with Binary.com.